Topman are one of the biggest high street names with a huge range of fashionable clothing at affordable prices. Now you can save even more when you shop online at Topman.com with this exclusive 10% off voucher code. With all the current and future fashion trends online you are sure to be looking one step ahead of the game. 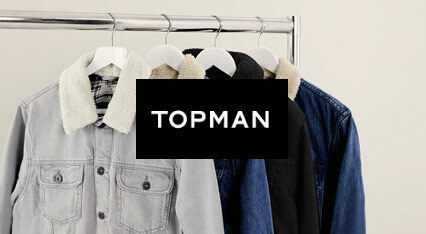 Topman provide a free delivery service for all orders over £50, you can also collect items from any store if you are close by. There is also an option for express delivery should you require your clothes urgently. You can return any unwanted clothes to any store or via post, completely free of charge. This top notch customer service really helps with making the right choice over what to wear. This exclusive Topman discount is valid for all TroopScout users: serving members, ex-forces, family and friends. 3. Enter the voucher code (found on this page) at checkout to receive 10% off your order.